Sharps Compliance provides various solutions for home healthcare waste. Solutions include mailback sharps disposal, medication disposal, recyclable IV poles and sharps transport tubes. Solutions are designed for safety and proper disposal. Our mailback sharps disposal solutions are ideal for at home self-injectors in need of disposal of their sharps (needles, syringes and lancets.) Mailbacks are available in our online store and include a sharps collection container, prepaid mailback box, instructions for use and materials to package for transport. Mailbacks are simple to use- simply fill the sharps container, package according to instructions and hand to your postal carrier for return. Additionally, we sell the Complete Needle Collection and Disposal System at major retail pharmacies throughout the country. The Complete Needle System is a sharps container and mailbox box. The return and disposal is purchased separately through completeneedle.com. To locate a pharmacy selling the Complete Needle System, please visit completeneedle.com. Medication disposal is a growing issue in the country with nearly 4 billion prescriptions written and over $17 billion spent on over the counter medications each year. It is projected that 40% of medications prescribed go unused, which leads to stockpiling in homes. For proper disposal of these unused medications, we provide the mailback envelopes and boxes for proper disposal. Our new TakeAway Medication Recovery Systems allow commingled collection of controlled (Schedules II-V), non-controlled prescriptions and over-the-counter medications. Each envelope and box is prepaid, so simply insert the unused medications per the included instructions, seal and return for proper disposal. Our Pitch-It brand IV poles are 100% recyclable and perfect for at home infusion. 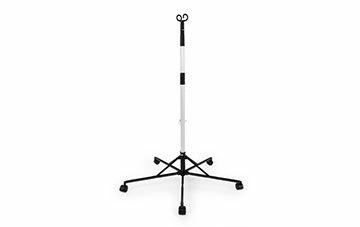 Our Pitch-It IV Poles are offered in two styles (drip infusion and pump mounted infusion). When therapy is complete, they are collapsed for storage or recycled. The Sharps Transport Tube is the ideal solution for "on-the-go" individuals who self-inject drug therapies and travel, live or work in environments where short-term containment of used sharps is necessary. 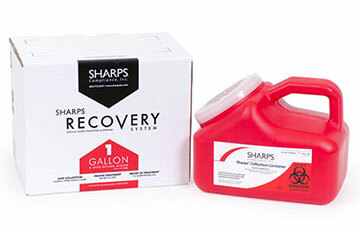 Fill the tubes with your used sharps; then place inside a Sharps Recovery System for mailback disposal. Why is it so important to keep my sharps, such as medical needles, syringes, and lancets out of the trash? There are more than 6 million people in the U.S. infected with hepatitis B, hepatitis C, HIV, syphilis, or other contagious diseases, which can be contracted from a stick with a used hypodermic needle. Over 3 billion needles are thrown into the trash each year by home users treating these and other diseases, as well as conditions such as diabetes. Even if first placed into a secured container, these containers can break open when the trash truck compacts them. Workers can be stuck with the needles and must go through months of testing for HIV and hepatitis because they do not know where the needles came from or what diseases they may carry. For this reason, even non–business generators of sharps must follow their state requirements. The Environmental Protection Agency (EPA) states that trashing sharps should be avoided, even if they are placed in a plastic or metal container. Mailback sharps disposal is one of the EPA suggested alternatives. Is it safe to send used sharps through the mail? Yes. But only if you utilize a mailback system approved by the United States Postal Service (USPS). These mailback systems include the sharps container (the primary puncture-resistant container you place your sharps into), packaging, postage, and tracking. 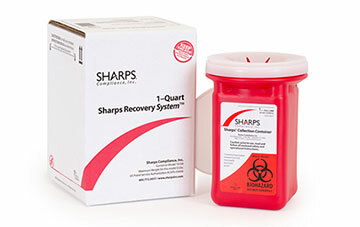 It is illegal to mail sharps, even in a sharps container, in any other packaging. Make sure you're using a compliant sharps mailback and disposal system. The Sharps Compliance mailback systems are specifically approved by the USPS and have been in use for over 20 years. A USPS permit number is printed on the front of every return mailback shipping box. This number is your assurance that the container and box, used as one system, may be mailed. What is the benefit of a mailback system for self-injectors of medications? Safety is important to all of us. Placing sharps, such as used hypodermic needles in the trash is not only unsafe, but in some states and communities, it may be illegal. In addition, convenience is a priority for most of us; it is even more so for those who are homebound. The Sharps USPS-approved sharps disposal system includes the sharps container and all packaging needed to mail it right from the privacy and convenience of your home. Mailback systems are legal and available in every state. Visit CompleteNeedle.com to learn more or visit our online store to purchase the mailback system that best fits your needs. What does my state say about putting sharps in the trash? All states have regulations or guidance regarding home sharps disposal. Every state’s guidelines advise to never put loose sharps into the trash or recycling. Many have stricter rules. For example, New Jersey recommends using mailback systems or other non-trash options. Oregon's laws state that no used syringes or other sharps can be put into the trash, even if first placed into an approved sharps container. In California and Massachusetts, it is also illegal to dispose of sharps in the trash, and mailback or drop-off sites are recommended. There may be hazardous waste drop-off sites in your community, but they are often not conveniently located. Always call your city first, as many do not accept sharps. Refer to our Regulatory Links page and click on your state. Remember, placing used sharps into the trash can be a danger to children, pets, and sanitation workers. The mailback system has been a convenient, safe, legal, and private disposal option used in the U.S. for over 20 years. You can purchase them in our online store or visit CompleteNeedle.com. What goes in my sharps container? As home self-injectors, you only need to place your sharps, such as needles, syringes, and lancets in your sharps container. Also, no more than 50cc (3 tablespoon) of any liquid can go into any one container. This allowance covers liquids such as medication that may remain in your syringes. How can I safely dispose of my used medical needles, syringes, and lancets when away from home? You're not always at home when you need to self-inject or perhaps test your blood sugar. More and more businesses are mounting sharps containers in their restrooms for self-injecting customers and employees. The FDA recommends that you carry a small, travel-sized sharps disposal container just in case you are not where a sharps container is located. Sharps Compliance offers secure, easy-to-use transport tubes that fit in a purse, pocket, or briefcase. How do I dispose of my pet's used needles or syringes? Use the same safe containment and disposal methods you would use in the home for sharps and syringes used on humans. Remember that there's no way to tell the difference between sharps used to administer medication to pets or used by humans who might have an infectious disease. If anyone is stuck accidentally by a random needle, medical personnel must assume the worst and conduct an extensive series of medical tests. Can I donate unused syringes and supplies? In certain cases, yes, you can! Several non-profit groups collect unused, unexpired syringes and medical supplies that don't require refrigeration. Here are some examples of organizations that accept donations from individuals. Contact these groups directly to get more information about the items they accept and donation instructions. Can I recycle used sharps such as medical needles, syringes, or lancets? No. Used needles, lancets, or syringes must never be placed in the recycle bin! However, if you purchase a Sharps Compliance mailback, once mailed to us, your sharps are properly treated and used as an alternative fuel source. Even though you can’t recycle your sharps at home, we use the most environmentally-friendly treatment method for you! I’m concerned about how to dispose of my unused medications. Is it safe to put drugs in the trash or flush them down the toilet? Of course, our priority is keeping drugs out of the hands of those to whom they have not been prescribed. However, flushing medications is not recommended because of concerns about water contamination. In addition, when medications are disposed of in the trash, they can still get into the water supply from the landfill. There is also a danger that children or pets could accidentally ingest medicines placed into the trash. Depending on availability, there are several options for safer disposal of your unused medications.